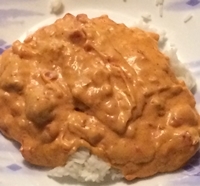 I made some adjustments to this recipe for pressure cooker chicken tikka masala. Instead of preparing the spices in the manner described I mixed them all together in a bowl, using granulated onion. I cut the chicken into cubes and tossed the pieces in the spice mix. I added olive oil to the bottom of the pressure cooker, put it on the browning setting, and browned the chicken. I then added the diced tomatoes and vegetable (not chicken) broth, ensuring that there was enough liquid to bring the cooker up to pressure. I sealed it up, set it for eight minutes and allowed ten minutes for a slow pressure release before releasing the rest of the pressure. I added the cream and cornstarch to thicken.